Facebook Page vs Facebook Profile: Do You Know The Difference? We all know what Facebook is and most of us have a Facebook profile. However, for small businesses just starting out on Facebook, it can be confusing to get started. As a Social Media Coach, I’ve talked to many small businesses and have encountered a few who don’t understand the difference between a Facebook Profile and a Facebook Page, and which one they should be using for their business. Yes, the Facebook Profile and Page are the two ways you can be represented on Facebook, but it is important to identify the differences between the two in order to effectively manage your business’ presence on Facebook. Here are the top 5 questions I’ve received from small business owners who are just starting out on Facebook. Plain and simple, a Facebook Profile is a personal account on Facebook. When you sign up for Facebook you get a Profile. This is a place where you can add friends and family members, communicate on a personal level, and share photos, videos, and life updates. Everyone who joins Facebook gets a Profile, and you can only ever have one under your name. A Facebook Page is a business account that represents a company or organization. A Facebook page allows businesses to promote specials and contests to followers who have engaged with their page by “liking” it. Having a Page also allows businesses to use Facebook advertisements. There is no limit to the number of Pages you can manage. Facebook Page vs Facebook Profile— Which one should I use for business? This question is an easy one to answer because using a Facebook Profile for business is a violation of Facebook’s Terms of Service. If you use your profile to share content for profit or not using an individual’s name, Facebook can delete it. However, you do need a Facebook Profile in order to create a Facebook Page, or you can convert your existing Profile to a Page. Why should I use a Facebook Page for business? Besides violating Facebook’s Terms of Services, small businesses without a Facebook Page face serious disadvantages. Having no page can create the perception that your business is out of touch with technology and social media users. It can raise questions about the progression of your business as a whole and significantly reduce customer trust. Facebook pages, unlike Facebook profiles, allow small businesses to quickly build a following without any limitations. Profiles force you to send a friend request before you can make connection, which can be problematic as people are hesitant to hit ‘accept’ if they don’t already know you. Pages, on the other hand, only require a “like” to start that relationship with a fan, prospect or client. Being able to track and measure results is another reason why you should use a Facebook Page for business. 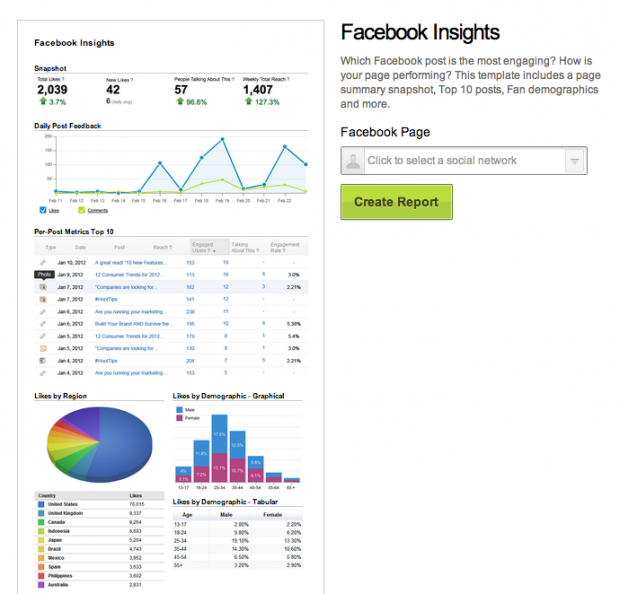 Facebook Insights allow you to track the positive impact and results of your social media efforts. To improve those results, a Page also allows you to take advantage of Facebook Ads and launch contests. Think of your Page as a microsite that you can use for commercial purposes and to directly engage with customers. What are some Facebook Page best practices? Create a strategy: Knowing what your goals are, how you’re going to position yourself, and what your tone of voice will be on Facebook is the first thing you need to do before you hit the ‘Create Page’ button. Build out your page: Make sure you include a link to your website, have high quality images, and make sure you thoroughly fill out the ‘About’ section. Be engaging: Nobody likes being “sold” anything online. Instead, showcase your product or service in a proactive and fun way to organically encourage engagement. And be sure to reply to all of your customers’ comments. Have a content schedule: Knowing what kind of content you’re going to share and when you’re going to share it is key to making sure you get the engagement you desire. Use Hootsuite’s publisher to schedule your messages in advance. Manage your Facebook Page and Facebook Profile with Hootsuite! Juan is a Social Media Coach. He specializes in ensuring users maximize their use of the dashboard, while incorporating their current social media strategies on Hootsuite.